He-Man tread through the murky landscape of the decimated Preternian village. The dreaded Snakemen had made quick work of this town. Broken pieces of pottery, discarded makeshift weapons, and the lost toy of a child littered the empty promenade. He-Man felt a rage burning in his gullet. He knew that the Sorceress had told him not to interfere, lest he change the course of time... but his desire to help these poor, beleaguered townspeople against the dominant forces of King Hiss was quickly overpowering his oath to the Sorceress. As his indignation rose, He-Man began scouring the area in search of his foes. Perhaps a straggling Snake warrior had stayed behind to pick at the pieces? Suddenly, a purple object shot down from above and caught He-Man in a glancing blow to the chin, causing him to drop his blaster. Foolish... he hadn't thought to look up in the trees. Shaking off disorientation, He-Man raised his eyes towards the source of assault. Straining to make out anything in the dense darkness, He-Man saw the shape of a humanoid standing in the trees. He-Man's hand shot into his cloak and fingered the grip of his sheathed Sword of Power. "Show yourself, Snakeman! And prepare to answer for your crimes!" As the figure moved into the moonlight, He-Man's jaw dropped. Webstor?!? Here, now? In Preternia? How could this be? "So... A foolish villager has stepped into my web. Now he must pay the price." spat He-Man's arachnid foe as he once again slipped into the darkness. He-Man lessened the grip on his power sword and let it remain sheathed. If this truly was Webstor, he couldn't risk pulling his sword. The Sorceress had disguised him for a reason, so drawing his sword now could possibly give away his true identity to Webstor if he too came from the future. Whirling on his heels, He-Man tried to discern Webstor's location by sound alone, since his vision was almost useless here. 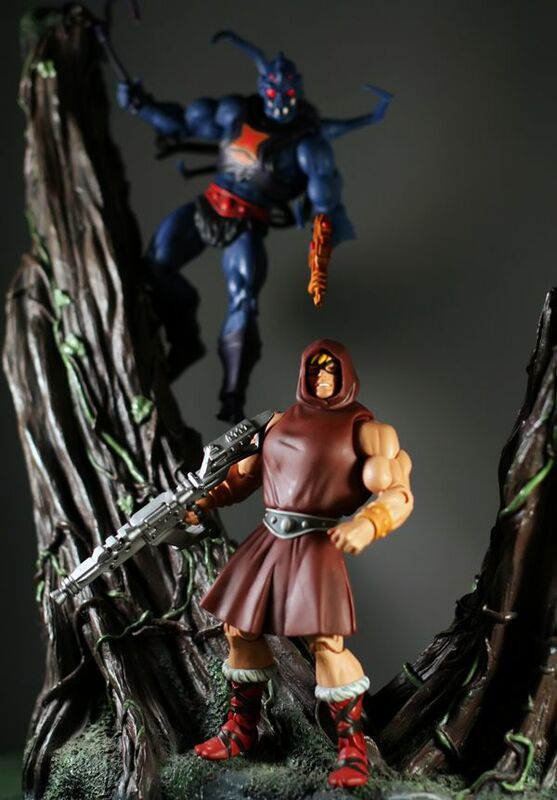 A shot from Webstor's blaster rang out from the trees, causing He-Man to dive out of the way. Rolling into a crouched position, He-Man again scoured his surroundings. He quickly realized that the gunfire wasn't meant to hit him at all. Webstor had used the firing assault simply to maneuver him into the open. He-Man tried to move back to the cover of the trees. But it was too late. Webstor's grapple fired out, encircling He-Man's legs in flash. The metallic cord wound around He-Man's ankles, cutting into his boots as it tightened. He-Man hastened to free himself. Ripping the cord from his bleeding ankles, he struggle to his knees... only to look up into the barrel of Webstor's rifle. "Sorry friend. It appears your luck has just run out." hissed Webstor. And as he listened to the energy build up inside the weapon, anticipating an explosive release, He-Man's last thoughts were of disappointment. He had failed himself, he had failed the Sorceress, and worst of all... he had failed all of Eternia by allowing himself to die in the past.